According to the Academy of Allergy, Asthma and Immunology, asthma, a chronic lung disease, affects more than 25 million people in the U.S.; that’s about 1 in 12 Americans. Of all asthma sufferers, about 7 million are children. Asthma occurs when your airways become inflamed and narrowed. You might complain of feeling chest tightness and may wheeze, cough, or feel short of breath. These symptoms result when your airways react to substances that are inhaled as you breathe. The swelling, inflammation, and increased production of mucus can result in an asthma attack. Severe asthma attacks often require emergency treatment and can even be life-threatening. Treatment is often aimed at reducing allergens. Pollen and airborne spores often cause problems for asthma and allergy sufferers, who tend to stay inside when the pollen count is high. But indoor air quality is also a problem, especially in the bedroom. Many allergens float in the air, but they also settle on surfaces and can be disturbed with cleaning. Making the bed or turning the mattress can also release allergens into the air. Although you can wash your bedding, a mattress is a little more difficult to clean. 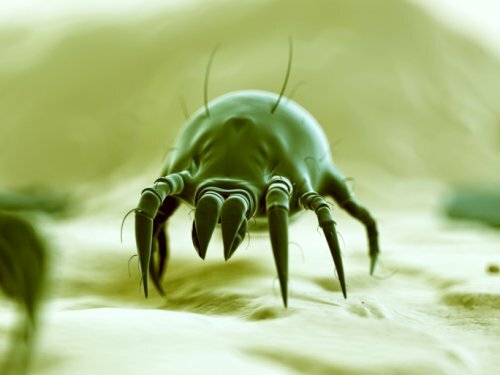 Dust mites are one of the worst offenders in causing asthma to develop. These microscopic insects are found by the thousands in the average home. Your body sheds small particles of skin every day, many of which end up in your bedding and on your mattress. Dust mites feed on these scales, producing body waste that can float in the air and be inhaled each time you breathe. Any type of movement, like walking around in the bedroom, turning over in bed or shaking the bedding, can cause the allergens to be released into the air. It is these waste products that irritate your airways and cause an asthma attack. Mold is another source of allergens. Mold creates spores that live in your mattress until a little moisture allows them to grow and bloom. Cleaning a mattress with water-based methods provides the damp conditions mold loves, and can actually make the problem worse. Water-based cleaning also requires an extended drying time, which can allow mold and mildew to grow in your just-cleaned mattress. To help you, Clean Air Solutions now offers the Hamilton Mattress Cleaning Service, which uses a dry cleaning process. Regular mattress cleaning will decrease the allergen content of your mattress and thus your asthma symptoms. If you think about it, you spend about eight hours sleeping every night. If your mattress is loaded with allergens, that’s eight hours of breathing in something that makes your asthma worse. The Mattress Cleaning Service takes less than half an hour and is a chemical-free dry treatment that removes and destroys dust mites, bacteria, fungal spores, and other harmful debris that may trigger an asthma attack if inhaled. Vacuuming isn’t strong enough to get these substances out of the mattress; you need a much more powerful system. Once your mattress has been properly cleaned, cover it with a mite-proof cover to help prevent infestation. You can also help to reduce allergens in the bedroom by washing your bedding at least once a week to kill mites (use hot water). Asthma and allergies can be managed. Cleaning your mattress regularly is one of the strategies you can use. Call Clean Air Solutions today for your Mattress Cleaning Service quote.